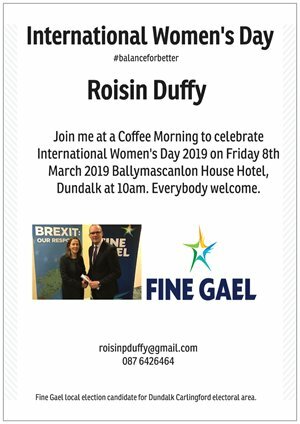 International Women's Day (IWD) is celebrated annually on March 8 and to celebrate it this year, local election candidate Roisin Duffy is hosting a coffee morning in Ballymascanlon Hotel on Friday 8th March 2019 at 10am. The theme for International Women's Day for 2019 is #balanceforbetter. IWD has occurred for well over a century, with the first IWD gathering in 1911. It is a global day celebrating the social, economic, cultural and political achievements of women. The day also marks a call to action for accelerating gender parity. "I thought it would be a nice opportunity to mark International Women's Day and particularly the theme for 2019 #balanceforbetter, which is particularly apt given that it is election year. "The event is not a womens only event and everyone is most welcome to join with me in this celebration. I look forward to seeing as many as possible there on Friday morning next".